On weekends I treat myself good. I enjoy the free time and to do whatever I want. Most of the time I am on the move. Since there is not much time during the week to meet my friends or to go for a long hike, I use weekends to relax and refreshen for the next week. Good food is essential for my little wellness programme. And this starts with a perfect breakfast. 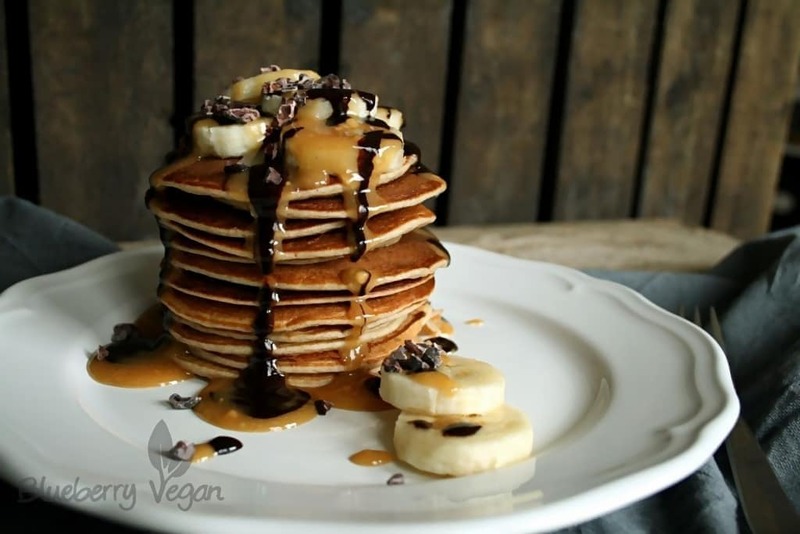 Almost no weekend goes by, that I do not eat some delicious pancakes for breakfast. I used to make pancakes with eggs, that I seperated, beaten the egg white and then folded the beaten egg white in the batter, that I prepared from egg yolk, flour, milk and sugar. I do not make such an effort anymore and what can I say? 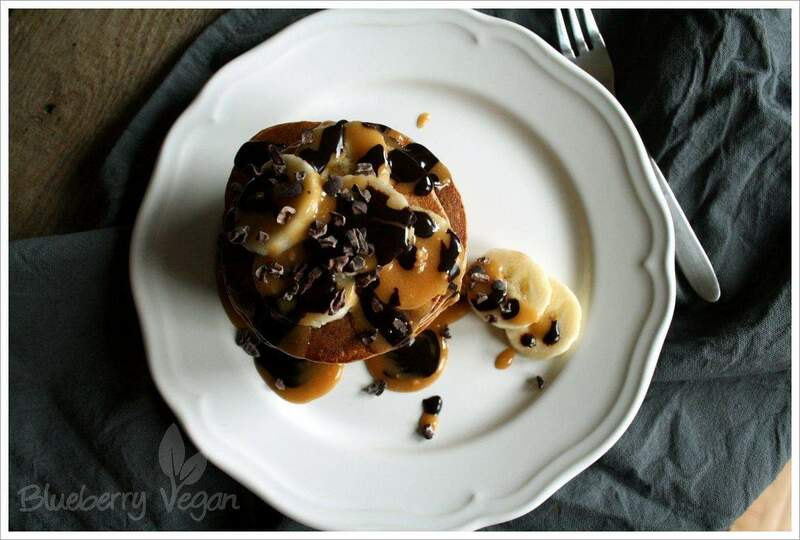 These pancakes are not only delicious, they also do not need sugar or fat to be perfect. To prepare the batter I blend the ingredients for about 30 seconds in my Personal Blender and then bake the pancakes in a non-stick pan. For the topping you can use whatever you like. 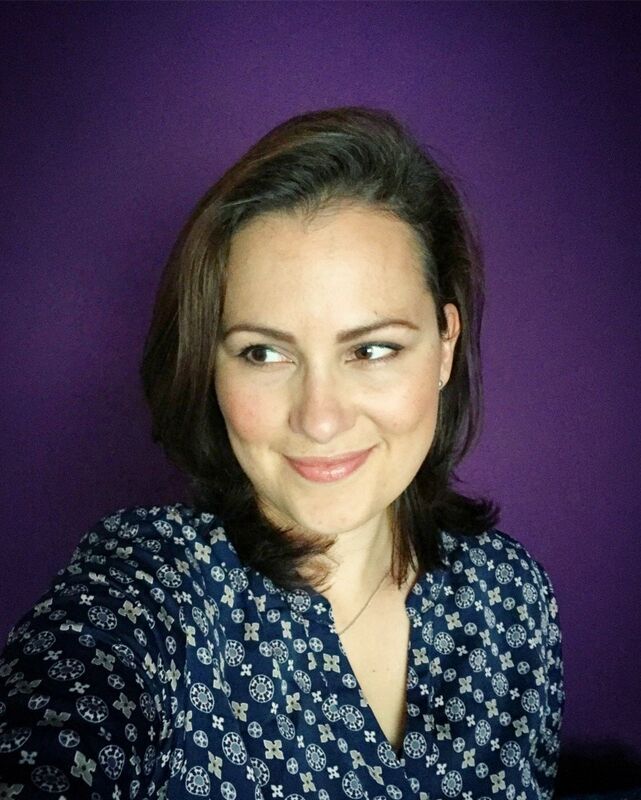 I like fruit (such as banana, strawberries, cherries, blueberries or raspberries), a tasty sauce (caramel, chocolate, peanut butter or maple syrup) and some cacao nibs, chopped nuts or hemp seeds. I hope you enjoy this pancakes. Have fun baking and eating them! Want more pancakes? Also try my blueberry buttermilk pancakes and oatmeal pancakes with apple slices and cinnamon syrup. Preheat the oven to 50° C (120° F). Keep half of the banana for decoration and slice it. For the sauces just combine the ingredients. Combine flour and baking powder in a bowl. 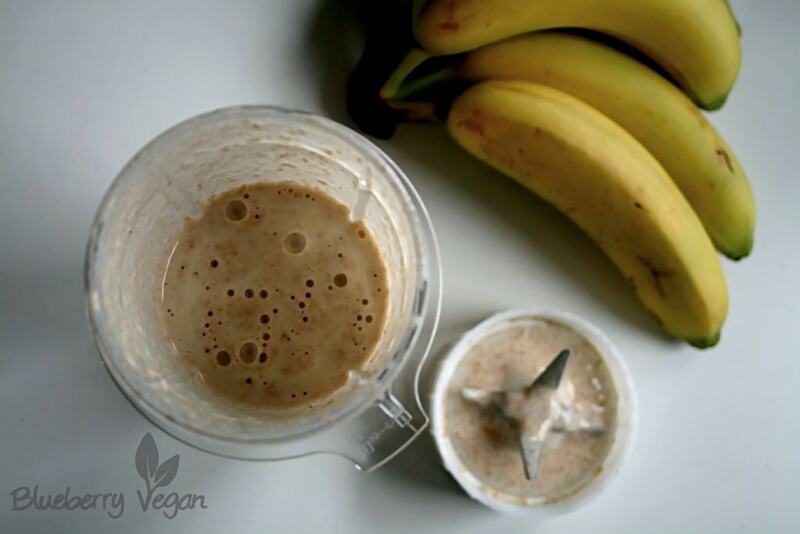 Mix half of the banana with the soya milk in a blender. Then pour the banana milk over the dry ingredients and combine. Heat up a non-stick pan to medium heat and pour a heaped tablespoon for each pancake in the pan, bake until the top starts to dry, then flip the pancakes. Place on a plate and keep them warm on a plate in the oven. Spread the banana slices on top of the pancakes, pour over the chocolate- and peanut butter sauce and sprinkle with cacao nibs. To prepare a fruit sauce just blend one handful of fruit with some maple syrup or agave nectar. 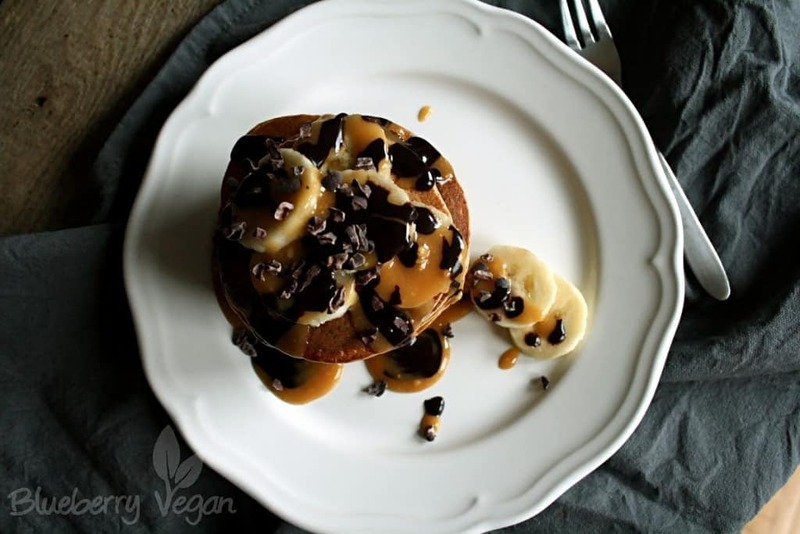 To make chocolate pancakes add each 1 tablespoon of cocoa powder and non-dairy milk and a teaspoon of agave nectar to the batter. 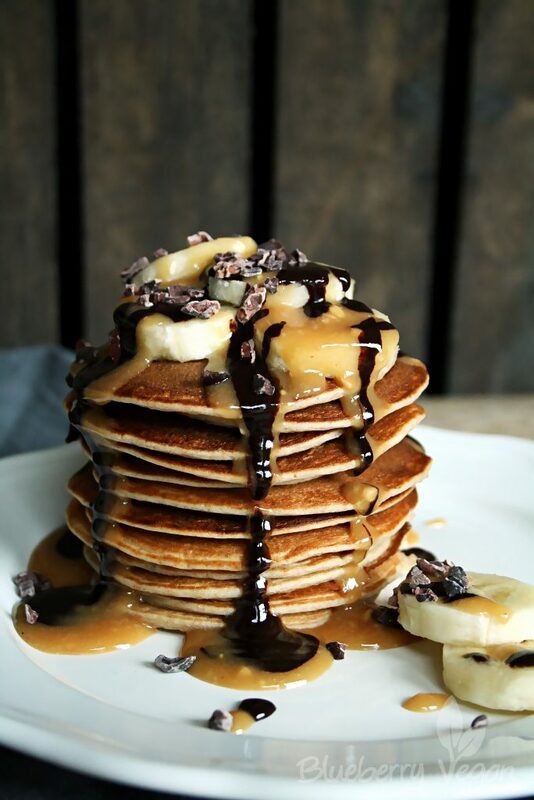 Wieviele pancakes werden das ca? das kommt ganz darauf an, welchen Durchmesser sie haben. Ich mache sie meist 8 cm groß und bekomme dann aus dem Teig 10 – 12 Stück. toll, dass sie dir geschmeckt haben! freut mich, dass er dir gefällt!! Haben heute morgen die Bananenpancakes gemacht. War leider kein Dinkelvollkornmehl im Haus, nur normales Mehl, schmeckte aber trotzdem ausgezeichnet, war halt etwas weniger gesund 😉 Den Bananengeschmack fanden mein Omni-Freund und ich echt Klasse!! Danke für deine tollen Rezepte, sie machen das Vegan sein sooo viel einfacher und kreativer!! ich danke dir für deine lieben Worte. Schön, dass es euch geschmeckt hat! 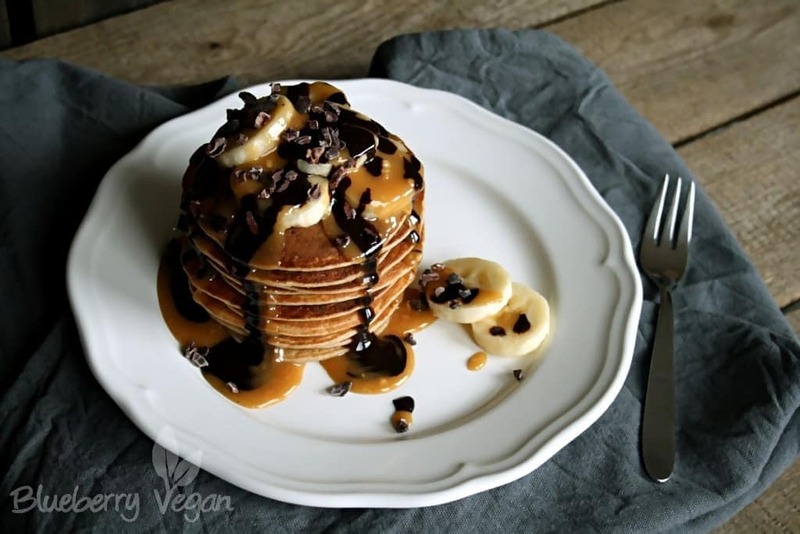 Ich war auf der Suche nach einem veganen Rezept für Bananenpancakes und nachdem ich hier fündig geworden bin und mir deine tolle Seite genauer angesehen habe, kann ich mich gar nicht entscheiden, ob ich nicht doch die Frühstückstaffeln ausprobiere. Ich werde wohl beide Rezepte ausprobieren und noch einiges mehr nachmachen und -kochen…Vielen Dank für diese Seite ich freue mich schon noch mehr Rezepte zu entdecken! es freut mich, dass dir meine Seite gefällt und wünsche dir ganz viel Spaß beim Ausprobieren der Rezepte! ? Loving your recipes. Glad I found your blog! Thank you very much! Your’s looks great too! Du liebe Güte! Was für eine tolle Seite! Was für tolle Rezepte! Ich weiß gar nicht, was ich zuerst nachkochen soll! Habe Dich über die WW-Community gefunden. Vielen, vielen Dank für diese tolle Seite! Ich bin hin und hinüber ? vielen Dank für deine lieben Worte. Freut mich, dass dir meine Seite gefällt! Ich wünsche dir viel Spaß beim Ausprobieren meiner Rezepte! Hi, I'm Rina! So glad, you are visiting my page. 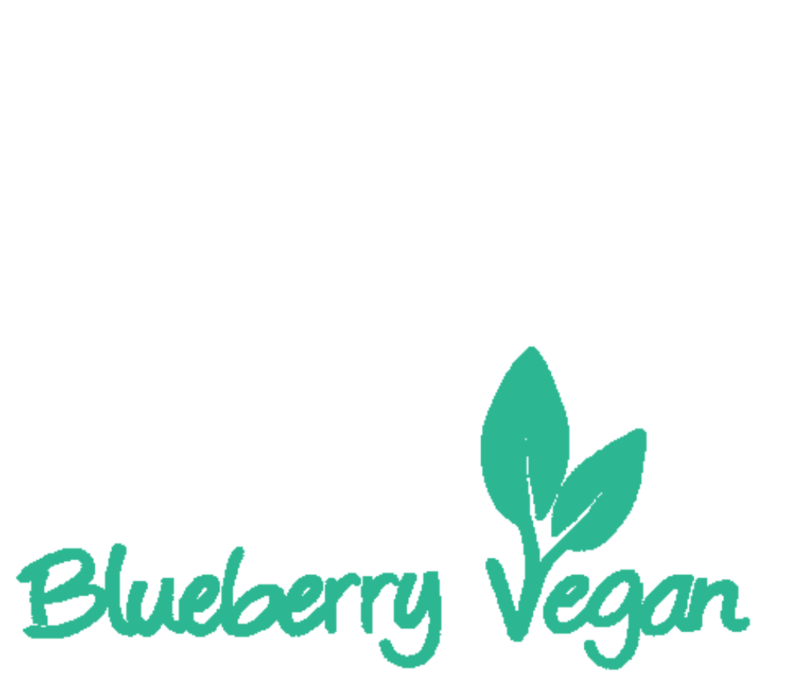 On this site I'm blogging about delicious vegan food. Have fun browsing and getting inspired for daily dainties! You like my page? Then support me by making a donation. Thank you very much!